South Korean football player Jang Hyun-soo has been slapped with a life-time ban from the national team for doctoring his community service records. The Korea Football Association's sports fair play committee, formerly the discipline committee, ruled on Thursday that Jang will be permanently barred from representing South Korea and will be fined 30 million won ($26,340) for his misconduct. The decision automatically rules Jang out of the Asian Football Confederation Asian Cup next year. The continental tournament will be held from Jan. 5 to Feb. 1 in the United Arab Emirates. The KFA had already announced Jang would not be selected for South Korea's friendly matches in November, a decision that was made after Jang requested to sit out to allow him time to complete his community service. Jang recently admitted his wrongdoing after Rep. Ha Tae-kyung of the Bareunmirae Party accused the defender of doctoring his community service records during a parliamentary audit meeting on the Military Manpower Administration. According to Ha, Jang submitted a document stating that he had completed 196 hours of community service in December 2017. But it turned out that the outdoor activities Jang claimed to have completed were impossible on the specified dates due to heavy snow. 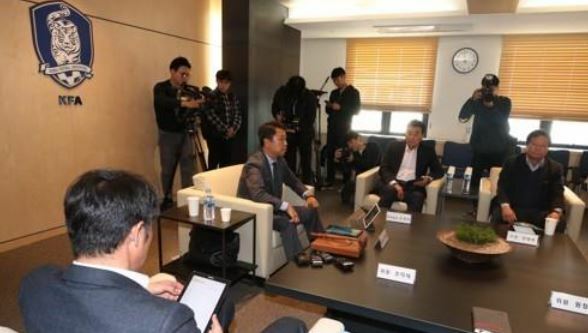 In addition, photos that Jang submitted for proof of community service on various dates were actually all taken on one day, the lawmaker claimed. Under the conscription law, those who falsify community service records receive a warning and a five-day extension to their original service period. The sports ministry is expected to mete out such a punishment against the footballer regardless of the KFA ruling.